Would you like to try some of Williamsburg’s best restaurants at reduced prices ? 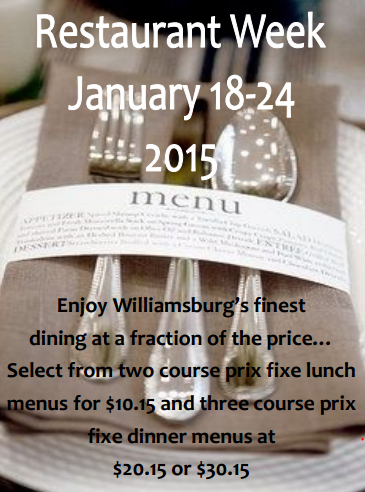 Restaurant Week 2015 in Williamsburg will be the week of January 18-24, 2015. I love this promotion in that it gives us a chance to go to our favorite restaurants without killing my wallet. You can enjoy a two course lunch menu for $10.11. For dinner, there will be three-course menus for $20.10 or $30.10. Tax, alcohol and gratuity not included. Although Williamsburg Area Restaurant Association is holding its 2015 Restaurant Week Jan. 18 – 24, Colonial Williamsburg is making its special menu available for much longer. Looking for a yummy lunch? Traditions at the Williamsburg Lodge has you covered. They are serving up an amazing two-course meal for just $10.15! The best part? It’s available through March! Chef Justin Addison and his Traditions team have created a comforting lunch sure to warm you inside and out during these bitter cold months—complete with a hot vegetable bisque alongside a ham and cheese sandwich with tomato on toasted bread. You also get a salad packed with feta cheese, pickled onions, and apples. Click here for the menu. How about dinner? There are two options for you depending on your mood. First up is dinner at Traditions at the Williamsburg Lodge. Enjoy a three-course dinner for just $20.15. That includes dessert! Click here for the menu. Over at the Terrace Room at the Williamsburg Inn, you can mix and match to your liking with our $30 three-course special. Click here for the menu. The dinners are only available through the end of January, so be sure to take full advantage! 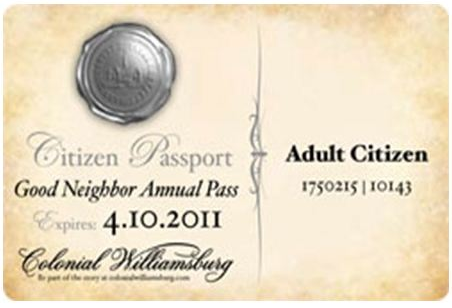 Annual, Good Neighbor and Collegiate pass members of Colonial Williamsburg can bring their friends and family for FREE beginning November 1 through December 15, 2014. Limit 10 tickets per household. Not a current pass member? Find out more about getting or renewing your Annual Pass. Find out more about getting or renewing your Good Neighbor Pass. Find out more about getting or renewing your Collegiate Pass. Just a reminder that Veterans and Active Duty Military can get 50% off Busch Gardens Williamsburg single day tickets! SeaWorld Parks & Entertainment is proud of our military that serve, defend and protect our country along with American veterans who served and fought. For your courage, valor and sacrifice, we thank you. In addition to the current Waves of Honor complimentary program for active military, Busch Gardens Williamsburg is celebrating our heroes for bookings through October 26, 2014 with 50% off single-day admission tickets (off front gate price) for qualified service members and veterans. This offer can be redeemed from September 2 – October 26, 2014. This offer is available to veterans and military members from U.S. only. This offer is available exclusively online or at participating military bases. This offer is not available at the front gate. Up to six (6) single-day admissions can be purchased. Active duty military who have already visited our parks using the Waves of Honor complimentary program in the last 12 months can take advantage of this offer. 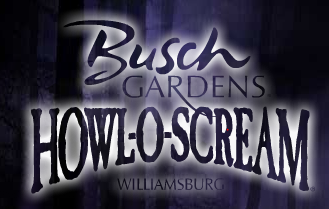 For non military Busch Gardens is still offering several coupons for discounts on Howl-O-Scream tickets. Starting Friday August 8, 2014 Colonial Williamsburg is offering an unbeatable end-of-summer deal to residents of the region – free one-day tickets to Colonial Williamsburg’s Historic Area and Art Museums August 8 -15 for adults and accompanying children. Residents of Williamsburg, James City County, York County and Gloucester County are eligible for the free tickets, as are those who live in Newport News, Hampton, Chesapeake, Norfolk, Portsmouth, Suffolk and Virginia Beach. The free ticket offer is only available at Colonial Williamsburg’s Regional Visitor Center, located at 101 Visitor Center Drive, accessible via the Colonial Parkway, Virginia Route 132 and U.S. Route 60 Bypass Road. The ticket counter is open from 8:45 a.m. until 5 p.m. daily. Proof of residency is required to qualify for free ticket. Members of the military who have temporary residence status should provide military ID and a piece of mail or other document that includes local address. Ticket must be used on the date of issue. The regular price of a one-day ticket is $43.95 for adults and $38.75 for children 6 to 15. Children under 6 are free. 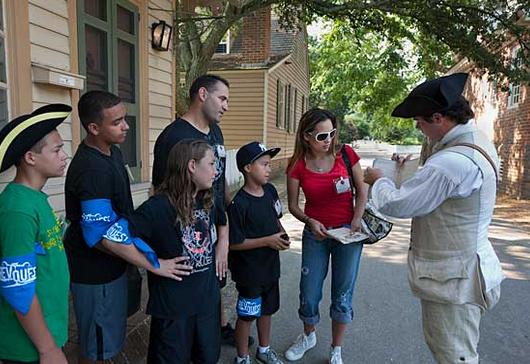 Active duty military, reservists, retirees, veterans, and their dependents receive free Colonial Williamsburg admission for the entire Memorial Day weekend—May 24–27, 2013. Gather for a modern service honoring military veterans who died while serving their country. A procession with Fife and Drum support will proceed from the Palace to Bruton Parish Church and the French gravesite. Wreaths will be laid, prayers given, and volleys fired at each stop to honor soldiers of the American Revolution and Civil War interred nearby. The Williamsburg Great Wolf Lodge is now offering limited-time day passes to its water park through Big Brothers Big Sisters of the Greater Virginia Peninsula. Up until now the only way to go to the indoor waterpark at Great Wolf Lodge was to stay as an overnight guest at the resort. For a limited time The Great Wolf Lodge in Williamsburg has teamed up with Big Brothers Big Sisters of the Greater Peninsula chapter to offer day passes to the water park. Through the Big Brothers Big Sisters fundraiser visitors can buy day passes, which allow unlimited admission to the water park for a four or five-day period. An overnight stay is not included, and it is not mandatory to use the tickets. The entire purchase price of each day pass will go to Big Brothers Big Sisters of the Greater Virginia Peninsula. Day passes are $30 each and can be purchased at the Big Brothers Big Sisters office in Williamsburg, located at 364 McLaws Circle, Suite 2. Passes will be available for five-day intervals (which do not include lodging): Nov. 11 to Nov. 15; Nov. 25 to Nov. 29; Dec. 2 to Dec. 6; Dec. 9 to Dec. 13; Dec. 16 to Dec. 20; and Jan. 6 to Jan. 10. Each pass allows entry from 2 to 9 p.m. on Sunday and 9 a.m. to 9 p.m. on Monday through Thursday. Two Amazing Parks. One Low Price. Buy a Busch Gardens 1-Year Pass and get Water Country USA for FREE. At Busch Gardens your family will find world-class coasters, up-close animal encounters and imaginative playlands like Sesame Street® Forest of Fun. Coming this spring, you’ll also brave the Black Forest on Verbolten, our new multi-launch coaster. Then, dive into Water Country USA for zipping slides and plenty of splish-splashing fun. Together they’ll make your adventure complete. Offer expires May 31, 2012. Visit your MWR/ITT office for these savings and other discounts on passes and tickets.